We belong to the Roman Catholic Diocese of Arundel and Brighton. Bishop Richard Moth has been appointed by the Holy Father as the fifth Bishop of our Diocese. Arundel & Brighton Diocese serves the counties of Sussex and those parts of Surrey outside the Greater London Boroughs. The Diocese of Arundel & Brighton was established in 1965, having previously been a part of the larger Archdiocese of Southwark. 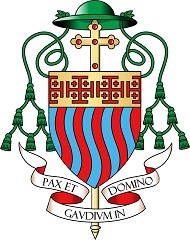 There were four Bishops preceding Bishop Richard: Bishop David Cashman, Bishop Michael Bowen and Bishop Cormac Murphy-O'Connor and Bishop Kieran Conry. The Diocese of Arundel & Brighton is celebrating its Golden Jubilee in 2015 and in preparation we are studying the four major document of the Second Vatican Council as we explore together what it means to be a Catholic Christian today and what we are called to do. The Diocese has a weekly Mass attendance of 43,377 persons, which would be approximately one quarter of the total Catholic population. There are 116 parishes with a number of other centres where Mass is celebrated regularly. Currently the Diocese has 173 diocesan and 97 religious priests, as well as 35 permanent deacons. We have 12 students currently training for the priesthood and a number for the diaconate. There are a large number of Religious Orders, both men and women, living and working in the Diocese in a number of apostolates. The Diocese has a total of 90 Catholic schools. Arundel and Brighton Diocese is one of the 22 Diocese of England and Wales, each served by their Bishop, who work closely together as the Bishops Conference of England and Wales. As a parish, in a Diocese we form a part of the universal Catholic Church, guided by Pope Francis, the successor of St Peter. The Catholic Church is the largest Christian denomination in the world. It has more than one billion members worldwide – roughly one in every six people is a baptised Catholic. For more information about the universal Catholic Church go to http://www.vatican.va/phome_en.htm.